One of my favorite sets in The Commons is the New York Public Library’s Japan / Kusakabe Kimbei, one hundred hand-colored albumen prints from around the 1880s. It covers a wide range of classic tourist scenes of Japan, and has provided me long hours of research entertainment since last December when the NYPL joined the Flickr Commons. On a recent trip to Tokyo I was happy to upload a few more photos of the scenes “now,” and excitedly visited an exhibition of a Kimbei album held by the Tokyo Metropolitan Museum of Photography. Travel photography spread out from Europe in the mid-1800s, reaching Japan with the arrival of Felice Beato in 1863. Beato leveraged highly skilled colorists from Japan’s domestic printing and advertising industry to add life to his black and white prints, creating works of art unique from other parts of the world. His apprentices spun off their own studios. One of these was Kusakabe Kimbei, who opened up shop in 1881. Within a few years, Kusakabe had a large array of photographs available by catalog: individually or in large, lacquer-bound volumes. The volumes offered a sampling of scenes from around Japan. These volumes remain in private and museum collections around the world, and NYPL has a fine example. Added to Flickr Commons, NYPL’s uniquely provide a great public window on Japanese tourism history. They were taken at popular travel destinations such as Nikko or Kyoto, in remote locations along the Tokaido road, and in and around the foreign settlement at Yokohama. With a bit of web searching and cross-referencing — especially with the wonderfully annotated collection at Nagasaki University — more precise dates and locations can be provided for many of the photographs, and they can moreover be understood in context with each other. The clues in online archives at Nagasaki University and the University of Washington, as well as photos hosted by Mitsubishi Electric and the Kanagawa Museum of Cultural History, send the camera spinning around the hotel and up the canal over a span of years. Finally, this leads to not only the location of the hotel, which is described on many Japanese sites, but to the actual positioning of the camera in the NYPL photo. It’s a treacherous sport that can take several hours per photograph, but is rewarding more often than not. Recently a commenter in one Yokohama photograph wondered where it might have been taken. A quick look at a David Rumsey map of Yokohama and a Nagasaki University image provided the name of the bridge in the photo. Back and forth with other folks on Flickr leads to an understanding of where to take the photo today, and what it might look like. 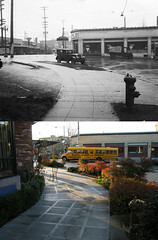 Creating a “now and then” coupling of photos is truly satisfying, and always educational. Hunting down a photo that someone else has taken is great fun. But the true way to honor these travel photographs is to visit the spots yourself, and perhaps take a “now” shot, as I discovered this on a recent trip to Tokyo. The new in each of these sets is by me. The discussion of the Yokohama photo happened after I got back, so it’s on the list to visit next time. Coincidentally, the Tokyo Metropolitan Museum of Photography is running a series of exhibits this summer [summer of 2009] titled Traveling Photography (Tabi suru Shashin). The first installment features, among other images, 50 Kusakabe Kimbei prints from an album in the museum’s collection. I thought it would be nice to see them in person and look for images I recognize from NYPL, Nagasaki, and other collections. What I didn’t expect, though, was how utterly stunning they look. Compared with scanned, digital copies, the beauty of museum’s physical artifacts was brilliant. They shimmered with life, and their colors had a luminosity missing from normal developed film, and certainly from reproductions made for the exhibit book and even the hard-bound biography printed in 2006. Now I’m hungry for more, and I hope everyone else is too. I’d love to see a traveling exhibit of Japanese travel photography, akin to the one in Tokyo but paired with “Now” photos from Flickr (I volunteer to take missing photographs, if there’s grant money lying around). It would feature holdings by many institutions — among Flickr Commons participants, at least George Eastman House, the Smithsonian, and the NYPL hold Kimbei photographs, and more likely have other old photos of Japan like the NYPL’s. These works of art need to get on the road, and be gawked at as they were originally intended!